Nastia Liukin is a five-time Olympic gymnastics medalist, the 2008 Olympic all-around champion, and was named 2008 athlete of the year by multiple organizations. 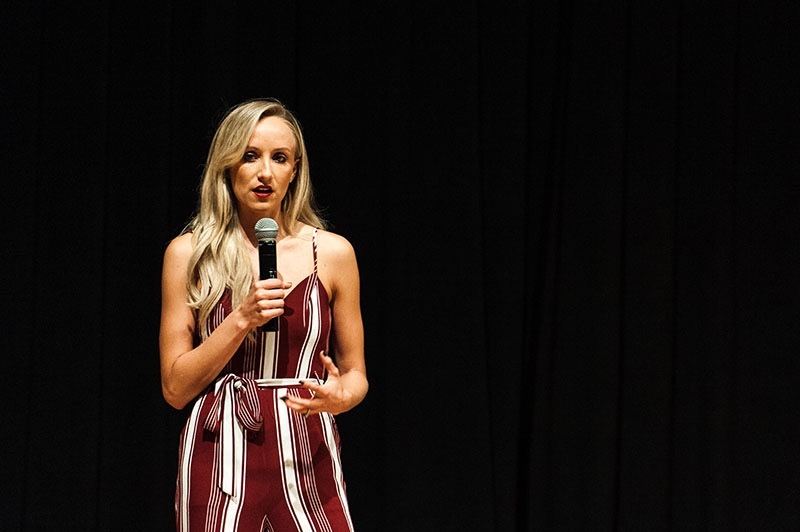 But, Oct. 12 at the Weasler Auditorium, she told students the most important event in her life was her career-ending fall at the 2012 Olympic trials. Liukin spoke about her early years as a gymnast and her struggles with self-confidence leading up to her 2008 Olympic debut in Beijing. Through all of her triumphs and setbacks, Liukin says her biggest takeaway was to never quit on a bad day. After her success at the Beijing Olympic games, Liukin decided she wanted to try for one more Olympics. She went back to training seven hours a day, six days a week, working harder than she ever had. She made it all the way to the Olympic trials, and then fell off the uneven bars during a routine. Liukin’s father, who was also her coach, said she could walk off, but Liukin decided to finish the routine. Liukin’s speech also touched on self-doubt, and offered advice to students for gaining back their confidence and motivation. Erin Zinkula, a sophomore in the College of Health Sciences and member of Marquette Crew, said Liukin’s advice about perseverance resonated with her. Liukin no longer competes in professional gymnastics, but she hasn’t strayed far from the sport. She is currently a broadcaster at NBC, and was a commentator at the 2016 Rio Olympic Games. Madison Hicks, a freshman in the College of Communication, was moved by Liukin’s speech. In 2009, Liukin established the Nastia Liukin Fund in conjunction with USA Gymnastics. Its mission is to encourage young people to live healthy and active lives. The organization partners with athletic clubs around the U.S. and provides financial aid to young athletes. Liukin stressed the importance of education and finishing school, and left the audience with some final words of advice.